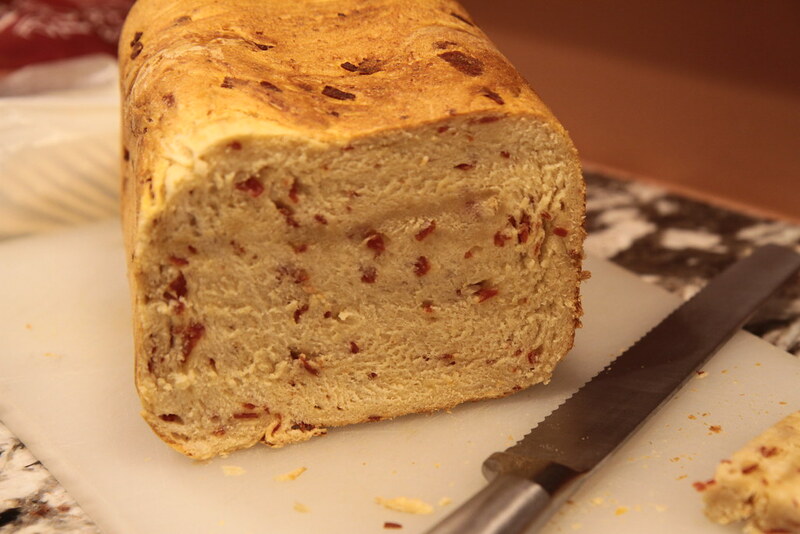 BREAD, post Photos and Recipes here. It is 26 degrees outside and snowing this is a great day to make bread. I rarely use loaf pans these days I like Cow Pile Loaves. This turned out to be another good bread. Gary350 wrote: All bread must have salt it needs a teaspoon of salt. 1 pack of double acting yeast or 1 teaspoon bread yeast. mix together and set aside for 15 minutes. Mix well and sift. Add 1 cup flour at a time to the liquid stir well each time. Kneed in the last cup of flour. Let stand 30 minutes then kneed until stiff about 30 seconds. Coat the top with butter then sprinkle on your favorite seeds, I used poppy seeds it was all I had. Let rise on pizza pan or cookie sheet until double in size about 1 hour. Bake at 375 degrees 30 minutes. Butter the hot bread on top. Cool 1 hour before you slicing. Bread loaf is 2.5"x7"x11"
Last edited by applestar on Thu Feb 25, 2016 4:36 pm, edited 2 times in total. Re: BREAD, post Photos and Recipes here. Question? My grandmother told me not to try to make bread on a cold wet day because it is hard to get the bread to rise. How do you get around that? Needless to say, I had the brilliant idea once to make bread because it was raining too hard to go out and I called my grandmother because the bread did not rise. Bread contains liquid usually water, milk, eggs, etc. Heat the liquid to 110 degrees before you mix it with flour. Do a fast yeast starter put 1 teaspoon of sugar in 110 water then sprinkle yeast on the water surface. After about 5 minutes stir in the yeast. In about 15 minutes yeast will start to foam. Time to add all the dry material. Bread is warm from the 110 degree water plus the yeast starter gets it started several times faster. Keep your bread in a warm place like setting on top of a large pan of warm water or on top of the warm kitchen stove. I went to Readyville TN yesterday to see what kind of real stone ground flour they have for sale. Wheat, barley, rye, buckwheat, corn, millet and others all $10 for a 5 lb bag. I'm not sure I trust grocery store flour I want the real thing to make bread. $10 a bag seems expensive but they grind and sell small quantities so I guess they have to make money to stay in business. I can buy corn, wheat, barley, rye, etc. at the Coop about 30 cents per lbs in 50 lb bags. I wonder if flour made from sweet corn tastes better than field corn I know all the grocery store flour is field corn. I found a used grocery store coffee grinder $250 wonder if that will make flour it is adjustable from course to fine? I'm not wanting to get into my own business of making bread flour and I have no clue what I would be with 50 lbs of each flour but it would be nice to have my own flour cheaper than $10 a bag. Northern Tool sells a hand crank grinder $50 I might splurge and buy one to make flour from some of my garden sweet corn. Several people selling $10 flour on ebay too. I'm just brain storming. I need several varieties of bread flour while cold weather is still here once it gets 100 degrees outside I don't want to be doing much cooking in the house it runs up the AC bill. I got a used kitchen stove to put in the garage so maybe I can still bake bread in the summer, I will CAN all my tomatoes and beans in jars this summer outside on that cheap used stove. Thank you Gary350 for the bread recipe. Looks good. Some interesting ingredients. That's a neat old house in that photo. I think it must be a house. The top level looks like a fun place to climb up to. And look at that foundation. Looks like there might be a creek in back. The windows are similar to my old wood windows built in 1906. That window near the porch looks interesting. Looks like there's an old style hanging light on the porch. Nice place. Gary, if you are going to have a bread recipe thread, you should link your No Knead Bread, easy and fast. digitS' wrote: Mom always put up to 50% whole wheat in her "refrigerator rolls." We do, too . Start melting the shortening in the hot water. Add the other ingredients and work them together as best you can in a large bowl. Turn out onto a floured board to finish that process, kneading just until the dough is no longer sticky. Place dough in a clean greased bowl, cover and refrigerate overnight. Shape into rolls or loaves the next morning. You can turn it out on a board again, roll it out, and make cinnamon rolls if you want. Allow to rise double, and it will take most of the day at room temperature because the dough starts off cold. Bake at 350Â°f until tops are brown - about 35 minutes. Except for ingredients, this is from memory. Last edited by applestar on Thu Feb 25, 2016 5:03 pm, edited 1 time in total. Reason: Added whole wheat substitution for the recipe. I'm trying this recipe today and I have a couple of questions. 1) It doesn't call for salt. I want to confirm that. In my sandwich bread recipe, the amount of salt determines how well the crumb holds together. No salt here, yes? 2) The recipe calls for one package or one teaspoon of yeast . A package is 2.25 teaspoons. Should I use one tsp or 2.25 tsps? I would love to get freshly ground real stone-ground flour and I'd gladly pay $10 for a five-pound bag. Supermarket flour is crap. Real stone-ground flour is awesome. All bread must have salt it needs a teaspoon of salt. Problem with this forum threads lock and typing errors can "NOT BE FIXED." Fix the forum. This is a Grain Mill built in 1812 not a house. It is built on the stream to turn the water wheel to power the stone grinding wheel. They make and sell several types of stone ground flour. I think you can order flour from them by phone or online. This Mill has changed hands many times over the past 40 years the new owner has finally found a way to make enough money to restore the place and kept this piece of history alive. They have a restaurant with some of the best food you ever ate. They have great breakfast, lunch and dinner too. Evening dinner often includes special stuff like music and dancing. People drive for 100s of mile to come here these days. We had brunch there last Wednesday it was a bit pricy but not bad considering we had too much food, ate 1/2 then took the other 1/2 home and got 2 meals out if it that made 4 meals be $5 each. Last edited by applestar on Thu Feb 25, 2016 7:17 pm, edited 1 time in total. That place looks really interesting. I don't know if I'm ever going to have the chance to visit, but I'm saving the info for future ref JIK. Thanks! Oh the bread and flour! I've mostly likely mentioned before, I do bake bread, about 1/week, 3 loaves in a batch. The mixture changes slightly each batch as I don't measure, just mix, knead, rise, punch down, put in loaf pans, rise, bake. Next time I bake may write down the basic recipe as I go. Some each of various grains from Bobs Red Mill including graham, spelt, brown rice. 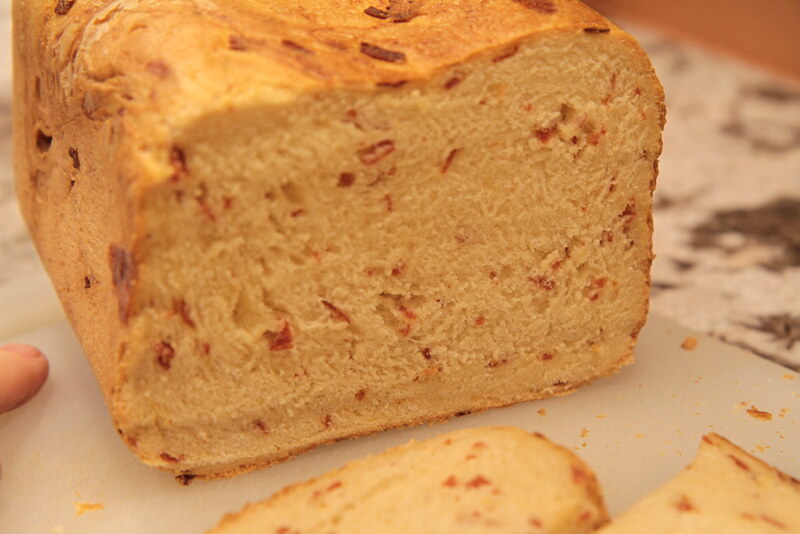 Corn meal -I don't use as it seems to make the bread more crumbly. A woman who comes to the farmers market for summer season has ground grains including rice, bean, corn, oats. 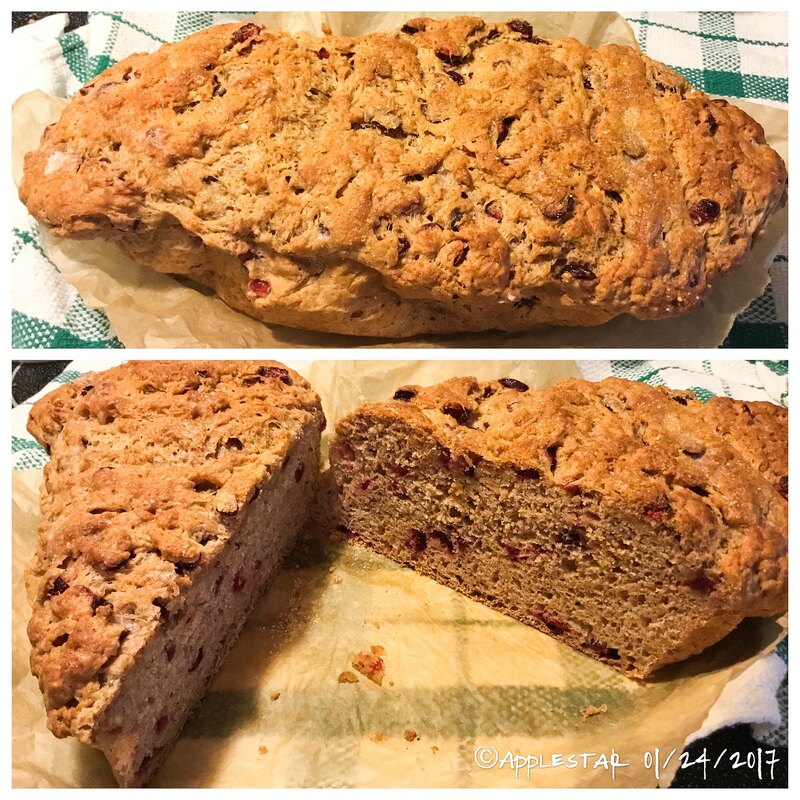 I have used the navy bean flour as another addition to the mixed grain breads. I need to encourage her to add barley to her offerings. I was inspired to bake bread. Incorporated leftover kefir-soaked muesli and 1/2 bag of fresh cranberries that needed to get used in the dough. Subbed kefir whey for water. Maple syrup for sugar. Yeast grew like crazy! I made this big loaf of whole wheat bread the other day it fills up the whole pizza pan. 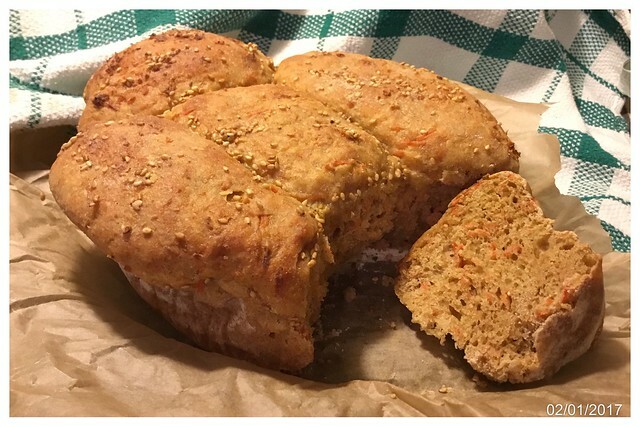 This bread has 1/2 cup of sunflower seeds, 1/2 cup flax seeds, 1/4 cup millet, it turned out good. Basic bread recipe is 4 cups of bread flour, 2 cups whole wheat flour, 1/2 cup sugar, 1 1/2 tsp salt, 2 pack or 2 teaspoon of yeast, 110 degree water. Bake 350 for 20 minutes then 400 for 10 more minutes or until crust is golden brown. Interesting! Do you add the pepperoni and the cheese or is it part of the packet? What do you need to add? I used same basic no-knead buttermilk roll recipe as above but used kefir whey mixed with shredded carrots cooked until softened in butter and water, then added to the whey to "warm" temp for the sugar (coconut sugar), sea salt mixture for proofing the yeast. Mixed whole wheat white wheat, bread flour and a bit of gluten-free all purpose mix (the ingredients help with whole wheat flour). Rolled into 5 balls, then placed in parchment-lined warmed casserole. Glazed the top with orange juice/butter/carrot reduction and sprinkled with white sesame seeds, baked covered with foil for the first 1/3, buttered the top while cooling on the rack. applestar wrote: Interesting! Do you add the pepperoni and the cheese or is it part of the packet? What do you need to add? I chop and cook the pepperoni, save the pepperoni oil, chop up some string cheese and add the cheeses, oil and cooked pepperoni to the bread maker when it "Beeps" during the sweet stage.